Court-ordered pirate site blockades are pretty common nowadays. While not everyone sees these as the ideal solution for the problem at hand, they follow the letter of the law. More problematic are the private blocking efforts by various Wifi providers, which we are frequently the target of. Apparently, TorrentFreak is a pirate site too. From Australia to Sweden, all around the world courts have ordered ISPs to block access to pirate sites. This usually happens after a careful review by a judge, who weighs the arguments from copyright holders and Internet providers before a final decision is made. That’s a fair process. However, these court-ordered blockades are only the tip of the iceberg. Much more common are private blocking efforts where local WiFi providers use broad blocklists to shield people from visiting dangerous sites, including the one you’re on now. This problem is not new but the lack of improvement has become increasingly frustrating. This is no temporary or local mistake. In recent months we’ve received several reports of similar Virgin WiFi blockades, including from our colleagues at ISPreview. They ran into the same TorrentFreak blockade while conducting a study of WiFi performance in UK hotels. And it’s not just Virgin that’s doing the blocking here. 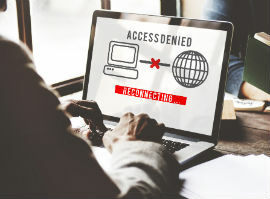 This week another reader alerted us that he was unable to access TorrentFreak on a GovWifi connection. This network is used by many government institutions and managed by the Government Digital Service. Apparently, they, or their blocklist provider, has classified our news site in the “Piracy and Copyright infringement” category, and accessing it would be a violation of the acceptable use policy. These two recent examples are related to the UK, but these broad blocklists are used elsewhere too. We’ve seen our site blocked in US libraries and airports, Norwegian trains, and even in a Canadian McDonalds. We have reached out to both Virgin and the Government Digital Service for a comment on the most recent examples. At the time of publication, we have yet to hear back. Perhaps our email is blocked too? We hope they can eventually shed some light on their motivations. In the meantime, let’s hope our readers have learned enough from our “hacking skills” to know how to bypass these blocks….